At Utopia Salon & Day Spa, you can look your best … for life! We make it easy with our convenient mobile app, which brings your salon and spa directly to your phone. You can instantly make appointments on the app wherever you are, with no phone calls and no waiting in line. Just select the day and time that’s perfect for you and instantly book your appointment. You’ll get a quick confirmation right at your fingertips, then, if needed, you can follow up with details for your stylist or esthetician. You can learn more about Utopia Salon & Day Spa on the app, including information about our awards, reviews from customers just like you, and you can view our gallery of photos of the salon and spa. You can also get a full list of traditional contact information. The app lets you view our entire menu of products and services, from hair styles and coloring to our complete custom spa packages. You can also learn about our loyalty program and its exciting rewards and incentives. You can also join our mailing list straight from the app to get the latest information on specials, trends, and tips. If you’re looking for a perfect gift for friends or family, a gift certificate from Utopia Salon & Day Spa is the perfect solution! You can purchase gift certificates directly from the app, and your friends and family can pick the perfect Utopia experience for them. A day of pampering at the spa is a perfect gift for anyone on your list. 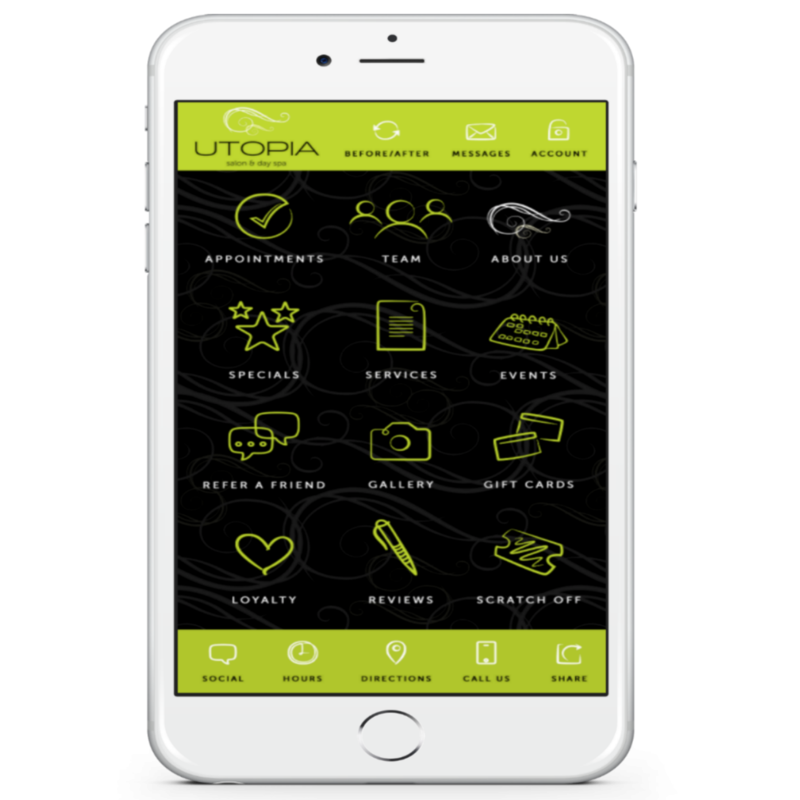 Download our free mobile app at the iTunes Store, on Google Play, or on Amazon and experience Utopia Salon & Day Spa right at your fingertips. Of course, we always love to see you in person. You can find us at 510 North East Avenue in Vineland, New Jersey or give us a call at 856-794-9200 to schedule an appointment or ask about our services.